In the year 449 Germanic tribes arrived in Britain from the European mainland, and displaced the native British (Celtic) population, eventually establishing a single language which was Anglo-Saxon in character. 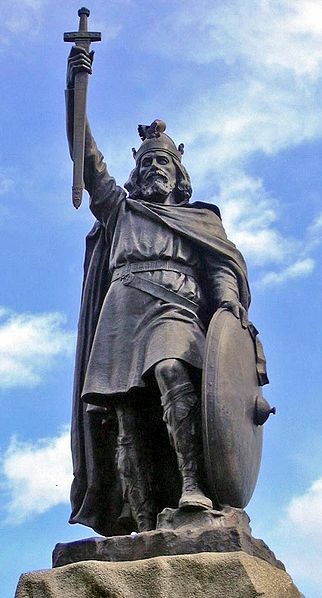 Most writings of the period are preserved in the West Saxon dialect, the language of King Alfred, spoken in the politically and culturally dominant region of southern England around Winchester. Descriptions of the language, known as Anglo-Saxon or Old English, therefore reflect this dominance. Fundamental changes began to affect Old English grammar during the later Anglo-Saxon period. After the Norman Conquest these grammatical changes, along with changes in pronunciation, spelling conventions, and a huge influx of new words, led to the language evolving a fresh character, known as Middle English. When Did English Become "Familiar"?